There have been depressingly few successful riders from Edinburgh. One of the best is Brian Collins, though Brian's best racing days were during the seventies when the Monarchs were not around, and he rode for Wembley Lions, Poole Pirates and Coatbridge Tigers. Brian had started racing at Cowdenbeath training school, and made rapid progress. He made team appearances in 1966 and early 1967, but sadly broke his leg at Hackney when on the verge of a big breakthrough. He fought back to win the Scottish Junior Championship on his return at the end of 1967, and when Monarchs moved to Coatbridge he continued to develop as a strong second string in the team. Monarchs closed at the end of 1969, and Brian moved south where he did very well in British League racing. He returned to Coatbridge in 1974 and there was a very influential captain, as well as one of the top National League riders. In 1978 he came back to Monarchs for a 3-season spell, still very capable though slightly past his best. His final racing years were with Glasgow and Berwick and he is still a regular attender at Scottish VSRA events. 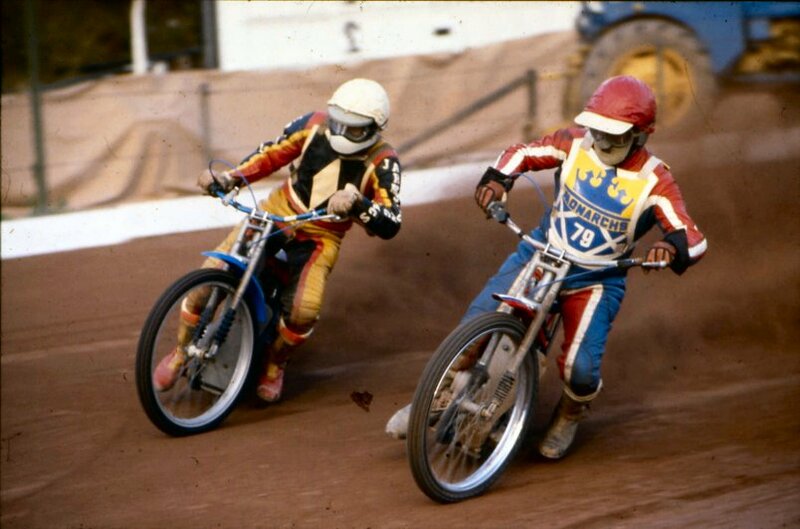 The photo shows Brian leading Newcastle's Robbie Blackadder at Powderhall in 1979.